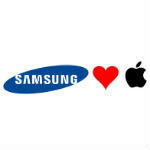 There is always a lot of chatter about how much Apple and Samsung hate each other. The two companies have been locked in litigation, traded jabs in advertising, and generally played the parts of being bitter rivals. But, the big problem with that view of the relationship is that it doesn't take into account two things: money, and marketing. On the first count, money, the two companies have been business partners for years now, because Samsung has been in charge of manufacturing the processors that Apple uses in all of its iOS devices. According to Digitimes Research, Apple is the number one reason why Samsung's microchip manufacturing is doing so well, with 80% of Samsung's microchip revenue coming from Apple. Of course, there have been consistent rumors that Apple is looking to move away from Samsung, and shift its processor manufacturing to Taiwan Semiconductor Manufacturing Company (TSMC), but as yet, those are just rumors. Although, Samsung's contract with Apple is expiring soon, which means those rumors could become fact quite soon. On the second point, marketing, we would all do well to keep in mind that there is nothing better for marketing than to have a foil. There's a reason why the Mac vs PC commercials existed, and now we see Samsung vs Apple baristas, and even Microsoft is trying to place itself in the game with its new Surface commercials (though no one really takes those seriously just yet.) Rivalries need not be bitter, especially when each company can use the other to stir up interest for mutual gain. micheal h apple spin article. Nothing new. All I'll say is you, sir, are beyond pathetic. While I haven't posted here in a couple weeks I have been checking in off and on and I have NEVER seen jimmies more rustled than yours. I do love how you name drop me every other post, way to not let me get to you, Moose. Michael H? Apple spin? Wow... quite the misperception there. Might be not the latest news. But Samsung makes money more than even galaxy's line cause of Apple chipset! imagine that if Apple cancelled the contract as they mentioned in 2014. P.S Samsung profit from Apple Iphone, Ipad and Ipod chipset manufactures around 8 billion $! I love his typical M$ bash in there too..
One does not simply stop bashing MS. Lol..
Apple can't leave Samsung if they want to avoid HTC style horrific launches. Stay tuned: Apple will be the next HTC. iRonically, Apple is iNcapable of making its' own microchips ... HA, some "tech" company!! Truth is: Apple would be no where (ZERO, ZILTCH & VOID) if it were not for the ideas and technology of others!! Keep bringing us these riViTing and informative truths. Which smartphone doesn't have any parts from another manufacturer? Can you name some? Thanks. Well, at least Samsung phones have no rotten Apple cores; they may utilize other manufacturers but, they get nothing from Apple. Except, of course, size-envy iPhone owners. Dude you need to relax, or go to Cupertino, climb the bell tower, and vent your frustrations. Maybe just go on a date...with a girl not your android device. Maybe when Apple shift to another manufacturing company, Samsung will be able to focus more on enhancing the big.LITTLE technology, and stop relaying on other SoC companies such as Snapdragon. There's an iPhone, and there's everything else. Apple wants this pubic perception that they're above the competition in quality, but it hardly produces any of its own components and uses that said competitor(s) components. Quite a conundrum there.